Industrial doors are an asset for a company, they improve efficiency, are practical to use and look good at the same time. At Larco we know how important it is for our customers to find the right doors for their needs so we’ve compiled this guide to take some of the pressure off your shoulders. Wherever you shop for sectional doors they have to look right. 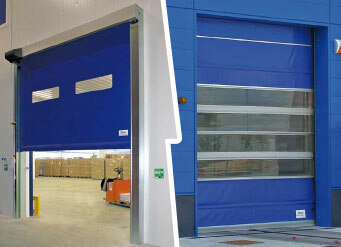 Sectional doors are main entry points for your business so the design of doors has to look right. Our doors are designed to complement the aesthetics of your industrial unit or warehouse setting and we think they add a sense of appeal. They can be pre-finished in a range of colours and materials and windows can be added to let filter into the building. Sectional doors come with a choice of manual or electric controls. Manual versions are equipped with hand chains that you pull to open and close the doors. Motorised versions are fitted with electric control panels and at the push of a button they open or close on demand. Electric motors are useful if you use the doors on a regular basis and they help to reduce manual labour tasks. Whether you want to improve energy efficiency or simply keep your buildings warmer the thermal protection of sectional doors is an important factor to consider. The Industrial Doors at Larco don’t just meet the requirements of building regulations they exceed them and this helps to eliminate draughts, improve energy performance and keep our customers warmer too! Nobody likes a noisy door, especially if the door is opened and closed on a frequent basis. That being the case look for whisper-quiet doors, we design and manufacture our doors to provide a low-noise operation. Another important feature to consider. How safe are the doors once they have been fitted? If you value safety within the workplace this will be your primary concern when you are choosing a new set of doors but don’t worry, the sectional doors at Larco conform to all the latest health and safety regulations.